Hope all is well and you are enjoying the spring weather! Today I created a pretty spring-themed friend card featuring some of the colorful and fun dew drops! Here’s a look at my finished card. It is approximately 5.5 finished size. I started with a green cardstock base and then cut several layers with some white cardstock and some patterned paper from the Doodlebug Hello Spring paper pad. I went around the circumference of the outer circle with a springy mix of diamond dew drops and some regular dew drops. I used the Citrine Diamond Dew Drops, The Green from the Fiesta Mix Diamond Dew Drops and the white circular ones from the Cotton Candy Mix. Here’s another look at the pretty dew drops along with the tulips I created and colored with my Copic markers. Here’s a view of what the card looks like when it is closed. For the top sentiment, I used a couple of my stitched oval dies and cut out the sentiment I created. Here’s a view of the second sentiment that I use to hold up the front of the card. I used some foam tape to give it enough lift so that the card front would stand up properly. You can also see a couple of the fun tulips I created and colored. Here’s the other side. You can also see underneath I have a white circle mat. This is where I will write my personal message. Here is one last look at the card standing up. I hope my friend likes it. I thought of her as I was making it! Please feel free to pin this image for some great spring, Dew Drop Inspiration! 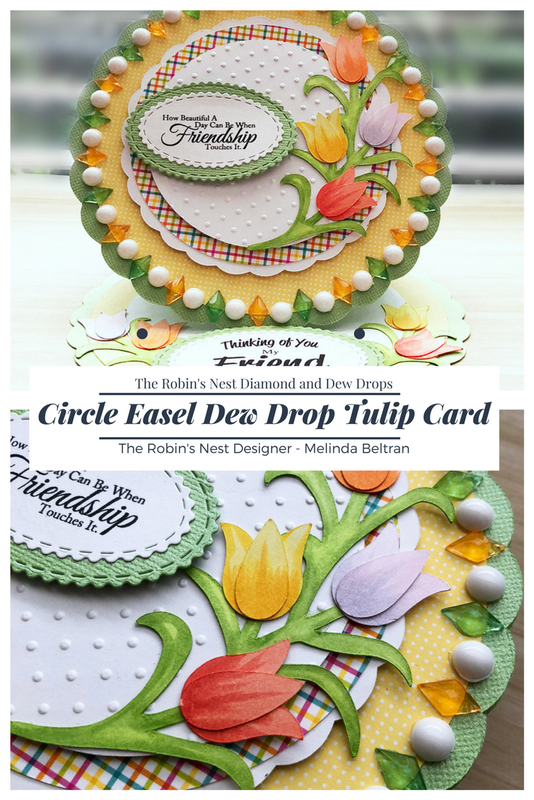 Be sure to head over to The Robin's Nest SHOP and check out all of the fabulous dew drops, diamond, tear and mini drops too! They are just the perfect embellishment for all your creations! Mel, this is a beautiful card!! Love it!